those are really cool and I'd like to make them. Jacquard Products offers a dizzying array of creative color tools for artists, hobbyists and crafters. Their products are highly sought after for textile applications and run the gamut from jarred paints to pens and airbrush liquids. Although Jacquard Products are designed for professionals, they can also help beginners achieve fantastic results. Their kits make it easy for anyone to make beautiful keepsake projects, anything from screenprinting to indigo dyeing to silk painting. We received the Funky Groovy Tie Dye Kit and Roo could barely control her excitement! We picked out items from each family member's closet to tie dye and bundled them and twisted them and bound them with rubber bands. Then we soaked them in a soda ash solution which acts as a fixative for the dye. While the bundles were soaking, I mixed up the dyes with tap water. These are incredibly vibrant dyes so gloves are a must! We went out to the patio for the actual dye application, just in case of imminent disaster, but the squeeze bottles that come with the Funky Groovy Tie Dye Kit keep mess to a minimum. To say that Roo loved squirting dye willy nilly onto our shirt bundles is a massive understatement. I must admit that it was a lot of fun, especially pulling back rubber banded areas to squirt in between layers. The Funky Groovy Tie Dye Kit is recommended for up to five shirts but we had a LOT of dye leftover, so I think they must mean five extra super huge tees, not toddler and preschooler sized garments. 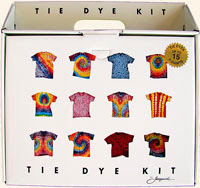 We could have easily done twice as many items with this kit but if you have a bigger group or a huge project (drapes, duvet cover, slipcover), you might want to try the Tie Dye Kit for 15 shirts. We're going to try that one out with Roo's classmates very soon! 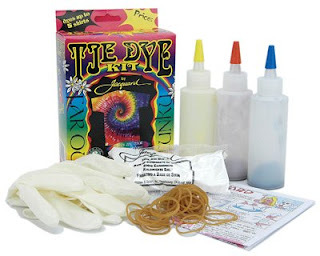 To enter and win a Funky Groovy Tie Dye Kit, please comment on this post with your favorite item from Jacquard Products. Entries will be accepted through June 24th and I'll pick the winner using Random.org. US readers are eligible. Only one entry/comment per person, please. For an additional entry, view my Whrrl story and click "I like it ♡" to help me win a trip to BlogHer '09, post my button on your blog (see code on sidebar), follow my blog, follow me on Twitter, fave me on Technorati or subscribe via email or subscribe via reader. Leave an extra comment letting me know what you did for each additional entry. They came out beautifully! Bravo Roo! I have to do my review this weekend, but I'm not sure I'll have time, since we're headed to a party today. But I'm excited to try it out. I love the Jacquard Marbling Starter Kit! I think the Marbling Kit looks really cool! This makes me think of tie dying shirts with Aunt Lois when we were little! It was lots of fun and she still tie dyes stuff! I'll have to tell her about this. I like the marbling kit. Thanks for the chance. I would love to try the silk colors kit as well. The Marbling Kit looks like fun! The indigo dye kit is pretty cool! How fun! The indigo dye kit looks great too. I'm following on Twitter as stlyhu. I like the Lumiere metallic paints. They are very unique shades. The castaway stamp pad is my favorite. I like the Mendhi Henna Kit. I would like the Professional quality sceen kit. I remember silk screening in school and I loved it. It would be a fun project to do with my older son. I'd also really love the Mendhi Henna Kit. The Marbling Kit looks fun. I like the silk colors kit. I think the henna kit looks amazing!! i like the indigo dye kit. I love the juice fabric markers! The Marbling Kit looks like a lot of fun. Thanks for the chance. The marbling kit would be nice. At Jacquard, I like the Marbling Kit. I love to make nice papers. I like the Marbling Kit! thanks! I love the transfer paper. I love the Painted Umbrella with cats on it. I would have to pick the Marbling Kit! I follow you on twitter as kngmckellar. I subscribed to your feed . I have a beautiful white dress that I absolutely love. But I'm messy and got a stain on it! :( With the Marble kit I could simply Tie Dye the Skirt that why I would still be able to wear it! :) Thank you! The marbling kit looks great. i like the class packs, great for craft night anywhere from church to school. That is a cool website. I really like the tye dye kits. When I was a kid I never got to make a tye dyed tshirt. This would be cool to make with my daughter. I love the Mehndi Henna Kit. I really like the Jacquard Marbling Starter Kit but I also like the Lumiere paints which I've used before and are really nice to work with! I follow you on twitter -- doodlebug40. They came out great! And it seems like it was alot of fun. The book Silk Diary seems like something my mom would love to have! i love the indego kit since bluue is my favorite color this would be awesome! thanks for the giveaway! I would love the Indigo Dye Kit! I like the majic touch painting kit. I really like the marbling kit! THanks for introducing us to a great new product! The Tee Juice Fabric Markers are pretty fun looking! I loved tie dying things with my daughter last fall. I think we'll do a tie dye party at some point. I would love to try out the Screen Printing Kit! I faved your blog on Technorati. oooo, I've always wanted to do marbling, so I'd love to try the marbling kit! I really think the marbling kit would be lots of fun! Great party ideas. I like the Mehndi Henna Kit! I also like the Indigo Dye Kit! I follow you on twitter – I am @zwriter! The Indigo Dye kit looks fun! That's my pick. I think the Screen Printing Kit would be fun. Thanks for the contest. The Mehndi Henna Kit looks pretty cool. I like the magic touch painting kit. I actually bookmarked their site to order a kit when I saw the review on CoolMomPicks. I would love to win! I just love their beautiful bamboo brushes! I'm subscribed via my google reader. I LOVE their Pearl Ex Powders - they are fantastic! If you do crafts you MUST give them a try! Those are really cool looking! I also like the marbling kit! I've missed ya, Naomi, and I'm back online and I re-followed your blog! I clicked on your Whrrl story and I said I liked it and commented! The Indigo Ink Kit looks awesome. My son and I would love doing these together! I like the indigo dye kit. I just love that rich blue color. The Jacquard Marbling Starter Kit looks very nice!